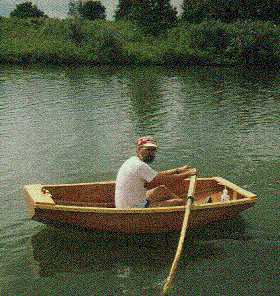 What surprised both Frank and me was that both of our WeeVee's would row at 4 mph, blinding speed for a 7-1/2' boat! WeeVee has a deep V center, 42" wide and 9" deep with a lot of rocker and no twisting to the bottom panels. It's actually pretty seaworthy too but is tippy if you are not seated. It's not for everyone. "Wind was SE 15+, rising, with 2-3' chop off the ocean. 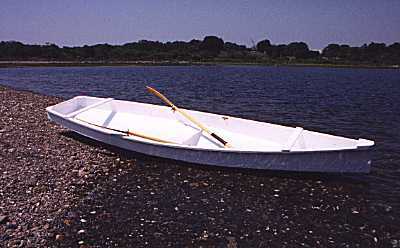 I rowed about 10 miles, then ran for cover in Pigeon Cove. The alternative was several more miles of windward slog followed by more miles of crosswind. It would have been too much for me." "The boat was dry, in good control always. It will cope with conditions in which you have no business being out." If I had seen that forecast I would have left my boat on the cartop. I haven't yet seen any photos of this year's race, but the results of 1999 and 2000 races are posted at www.blackburnchallenge.com . Last year 2 entries scratched and this year 35 scratched! But that brings up a very good point. 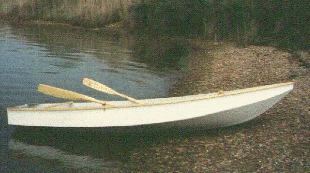 Good rowboats with experienced hands can handle those conditions for a while but you shouldn't set off into them if you can avoid it. You can get "blown away", especially if anything goes wrong, such as losing an oar or rowlock. And the same is true for any sort of power or sail boat - a small failure in moderate conditions can bring on a disaster. My own rule of thumb is to not venture out too far in whitecaps. "I agree with your observations about good plywood rowboats. While robote is not a real speedster, it is very pleasant and responds to greater effort with greater speed. Beaching is no problem; in calm water just lean over so one side of the V is horizontal. The boat grew on me during my 2 weeks on Cape Cod and is now beached at a town landing, to be used weekends the rest of the summer. One of my adventures involved a sudden storm with 2' chop crashing on the beach at South Monomoy when I needed to launch to return home; this wasn't pretty, but I got away on the second try.